The more moisture there is in the air the more likely it is that you will get condensation. For example in a bedroom at night, we add a lot of moisture to the air through breathing. Together with sweating this can lead to the air becoming saturated with moisture. 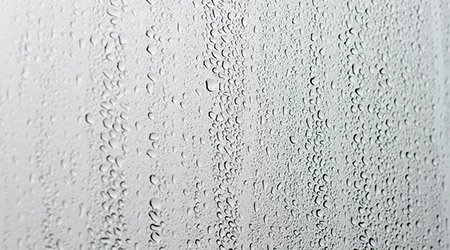 When this moisture hits a cold surface such as a window or external wall it condenses & forms water droplets. In order to prevent condensation, humidity levels, air temperature & surface temperature can all be improved. Room temperature & surface temperature are a factor but on their own they tend to push the condensation to a different part of the room or house. Typically onto window reveals, into wardrobes & corners with cold bridging. Controlling humidity levels with a ventilation system is the best way to eliminate condensation problems. This removes the source of the problem in the first place which is the excessive moisture in the air.